What is a Universal Reliability Definition (URD)? In Synthesis applications, universal reliability definitions (URDs) are complex resources used to represent sets of properties that can include failure behavior and maintenance tasks. URDs are resources because they are used to share important information across different Synthesis applications, and they're complex because they are built out of simpler resources (e.g., reliability models and corrective/scheduled tasks). This allows you to keep important reliability and maintainability information about a system or component in one place, where it can be easily reused and updated. For example, after analyzing the available life data for a particular component (Component A), you can use Weibull++ to publish the fitted distribution as a reliability model called "ComA_Reliability" that will be available for other analyses. 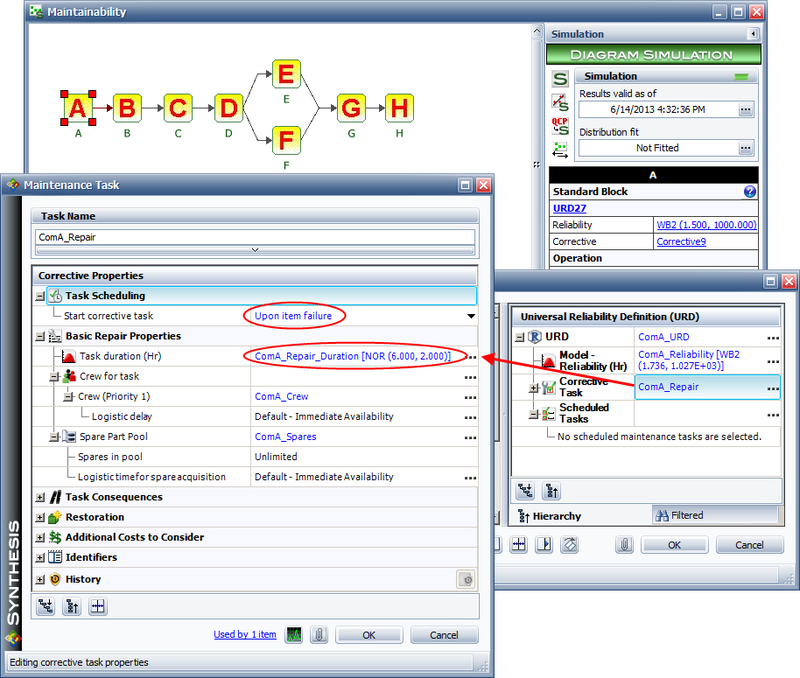 You can also create other kinds of models for describing maintenance tasks, such as models that represent the duration of a task, a maintenance crew's response time, the cost of a task or spare part, etc. These can be based on analyzed data sets, or you can use your knowledge about the behavior to specify the parameters directly. 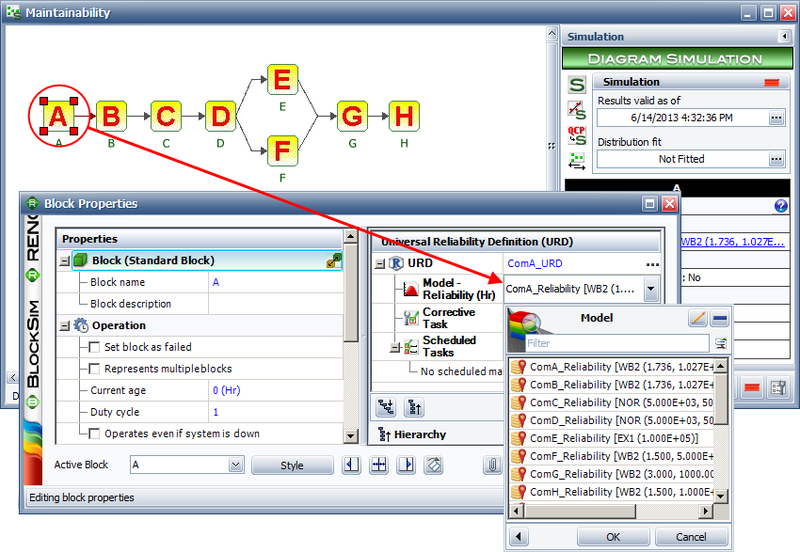 Then in BlockSim, each block in a reliability block diagram uses a URD to define the reliability and other relevant properties for a particular component or assembly. 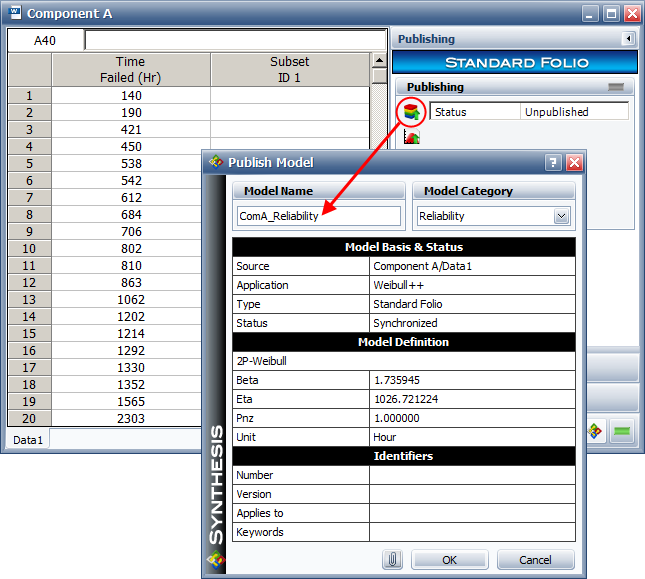 When you create a URD for a block, you can select to include any of the models that exist in the project. In this example, the reliability model published from Weibull++ is included in the URD as the reliability model for Component A. In addition to a reliability model, the URD can include other resources that describe the maintenance that must be performed to restore the item if it fails (corrective task) and any preventive or predictive maintenance that may be planned (scheduled tasks). In this example, a corrective task is assigned to Component A's URD. As you can see in the Maintenance Task window, this task is set to occur whenever the item fails, and the duration of the task is specified as being 6 hours on average, with a standard deviation of 2. A maintenance crew and spare part pool are also described in the task using resources. If you want to view or edit any of the URDs in a Synthesis project, the Resource Manager shows all of the URDs and other resources that have been defined and allows you to manage them. You can access this window at any time by choosing Project > Synthesis > Resource Manager.